It's getting cold out there. From the autumn rains to the blustery winter snow storms, stock up on plus size coats and jackets and be prepared for anything mother nature throws your way. Whether you live in a mild or frigid climate, Westfield has the plus size coats and jackets to keep you warm and cozy all season long. Heading out on a cold and snowy afternoon or evening? 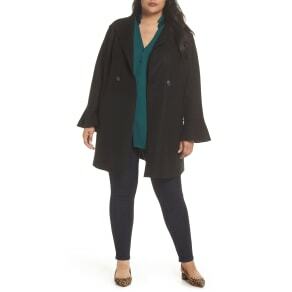 Bundle up in a plus size luxe down coat, wool peacoat or expedition down parka coats. Weather warming up, but still cool? Try a stylish plus size velvet puffer vest or lightweight down coat. Raining in your hood? Plus size belted trench coats will have you splashing in style. 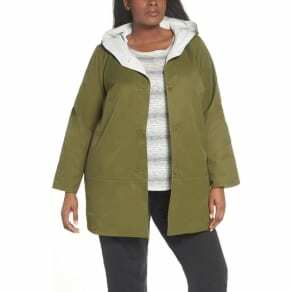 If you live in a warmer climate, a lightweight plus size jacket is not only good to have on hand for a cool evening, but also stylish with any outfit. 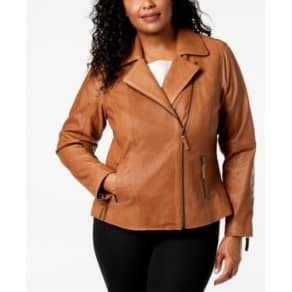 A plus size leather jacket is the perfect finish to a pair of jeans. Or try a chic plus size one-button velvet jacket to be on-trend. From plus size warm and cozy down coats to chic and stylish jackets to match with your jeans, dresses or maxi skirts, we’ve got you covered. Down, velvet, denim, corduroy, knit, ruched sleeve, pinstripe, or tweed, at Westfield, you’ll find all the plus size coats and jackets you’ll need in every color and style.